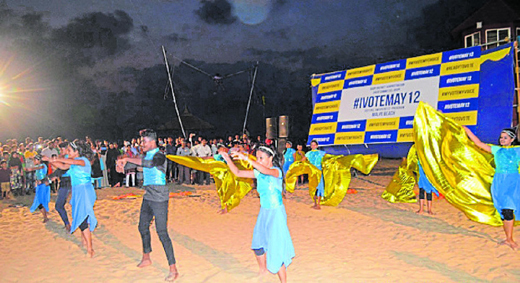 Udupi, May 05, 2018: The SVEEP committee of Udupi district organised a flash mob display on the shores of Malpe to raise awareness among voters about the need to exercise their franchise. Members of the Udupi Darpana team spread awareness through a flash mob dance. Amateur artistes also presented drawings on the occasion. Udupi DC Priyanka Mary Francis inaugurated the programme. Measures have been taken to create awareness among sexual minority community members, migrant labourers, physically challenged, senior citizens and hearing impaired people, he said. An election is a base for the democratic set-up of the country, he said. There is a need to strengthen the democracy by actively participating in the electoral process, he said.